While soap dispensers may not seem like the most enthralling bathroom accessories in the world, it's what you're taking out of your bathroom that will improve its overall appeal. According to the Washington Post, removing your plastic shampoo and conditioner bottles and replacing them with soap dispensers could be a wonderful way to jazz up of the look of your space. Let's face it, a selection of shampoo bottles on your shower's shelving isn't the most attractive accent in the world, and oftentimes you'll be straining to get every last drop out of the bottle. By adding two liquid soap dispensers in your shower, you can get rid of the unsightly bottles and incorporate a modern accent into your shower. A wall-mounted design is the ideal option, and you can pair it with an attractive soap dish to keep everything consolidated. It can also help to free up additional space in your shower by removing any excess shelving you may have been using to hold other toiletries. 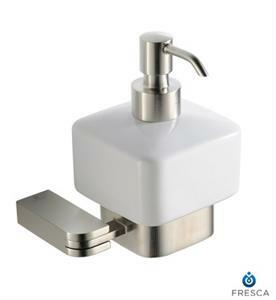 A pair of soap dispensers could be a fabulous upgrade that can revitalize the look of your washroom. What style of soap dispenser would look the best in your bathroom?